As everyone knows, there's only one of these every four years. The reason? It takes the Earth 365 days, 5 hours, 49 minutes, and 16 seconds to make one complete revolution around the sun. Did you know that there is no Feb. 29 in years that are divisible by 100, unless they're also divisible by 400? That's why there was a Feb. 29 in 2000, though there won't be one in 2100. Do you know anyone who was born on Feb. 29? TigerBlog doesn't. He assumes that everyone who was born on Feb. 29 makes the same "today is my 10th birthday" if they're 40 joke. That's okay. If you only get to have one of every four birthdays on your actual birthday, you get to make that joke. To Frederic, from the "Pirates of Penzance," it was no joke. He was to be an apprentice until his 21st birthday, and when he thinks he's reached it and is free, he finds out he was actually born on Feb. 29, which meant that he had 63 more years to go. Don't worry, it worked out just fine for Frederic and Mabel. That's how it works in Gilbert and Sullivan operettas. TigerBlog has always wondered why they decided to make February have a 29th. Now that he thinks about it, why does February have only 28 days in the first place. Who decided that? What did they have against February. Anyway, there's something mildly interesting about Feb. 29. It's something different. The last Feb. 29 was a Wednesday, so you probably have to go back to 2008, for the last time Princeton had events on a Feb. 29, which was a Friday that year. The last weekend in Febuary saw Princeton win two more Ivy League championships, running the academic year total to nine, with two still up for grabs in basketball and Princeton very much in the hunt for both of those. If you're keeping score, the Ivy titles for 2015-16 so far are in: women's cross country, field hockey, women's soccer, women's volleyball, women's fencing, men's fencing, women's hockey and now men's swimming and diving and men's indoor track and field. Those last two won their championships this past weekend. Neither was easy, and both spoke volumes about how those two programs have been run all these years. Both of the teams had to come from way back to win. There were large portions of the swimming championships at Brown and the track meet at Cornell where it looked like neither would actually pull it off. But that's how these programs are. They've won a ton of league championships between them. Their coaches, Fred Samara for the men's track and field team and Rob Orr for the swim team, are among the greatest coaches Princeton has ever known. The men's swimming and diving team won its seventh Ivy League championship in the last eight years. Was this one routine? Uh, no. Princeton had to come from behind in the final four events. How far behind? The Tigers trailed by 116.5 points with four events to go. That's a big deficit. Princeton came back to win by 21.5 points, which is a pretty narrow margin. They did it by having four point scorers in the 100 free and the 200 fly and then winning the final event, the 400 free relay in Ivy record time. As for men's track and field, the Tigers were in third place after Day 1. They battled back to tie it early on Sunday and then, as Princeton and Cornell have done for so many years, it was a, well, race to the very end. By the time it ended, Princeton had won by 20 points. The two victories seemed to be quite similar to TigerBlog. As he read the recaps of both, it was clear that this was not something accomplished by one athlete or a few stars. This was points here, points there, depth here and there, swimmers and divers and runners and throwers moving up a place or two and having that make all the difference. Samara called it "probably the finest team win we've ever had," and there's a lot of truth in that statement. These coaches coach what are essentially are individual sports. Their success, though, lies in their uncanny ability to build a real team culture and have that build off itself during the championship weekends. TigerBlog would guess that's not the easiest thing in the world to do, with so many different events, skills, needs and such. It takes a special touch to get them all to pull for each other, understand each other and consider each other as teammates. This past weekend, it was another lesson in how to do it right from Fred Samara and Rob Orr. Today may or may not be Sadie Hawkins Day. It depends who you ask. Traditionally, today would be a day where women were allowed to ask men to dance, or to get married. Today, though, such tradition is irrelevant, as woman can do that any day they want. But if you are going to be a traditionalist for a day, then Feb. 29 isn't a bad day to do it. So if you are a young woman and you happen upon a member of Princeton's men's swimming and diving team or indoor track and field team, then it is your right to ask them to dance. You know, a victory dance. Another one, for two of the most storied programs in Ivy athletics history. Kelsey Koelzer is the kind of hockey player whom you immediately notice. Even if you know little about hockey, you can't help but tell that she's a dominant force on the ice. TigerBlog should know this better than anyone, as he knows little about hockey and could tell right away this season that he was seeing a special player. She's fast and strong and powerful, and she definitely exerts her influence on each game. It's impossible to miss, even for the casual hockey fan like TigerBlog. As it turns out, TB was right. She is special. Koelzer, a Princeton junior, was named one of 10 candidates for the Patty Kazmaier Trophy, given to the outstanding player in women's college hockey. Koelzer is the only player from the Ivy League or ECAC on the list. Certainly St. Lawrence is aware that Koelzer is for real. It's only been two weeks since she beat St. Lawrence with an overtime goal. The teams, in fact, split a pair of one-goal games this year, each with a win at home. Now they'll get to see a lot of each other this weekend, as they face-off in a best-of-three ECAC playoff series at Baker Rink. The women's hockey team is not the only Princeton team who will play this weekend. In fact, there are 18 Princeton teams who will be competing this weekend. You have: men's basketball, women's basketball, men's hockey, women's hockey, men's swimming and diving, men's squash, women's squash, men's tennis, women's tennis, men's track and field, women's track and field, men's volleyball, softball, men's fencing, women's fencing, women's lacrosse, men's lacrosse and women's water polo. Of those 18, there are 11 winter sports, six spring sports and men's volleyball, which is sort of both. This is what the crossover season is all about. This weekend will see three (or maybe 3.5, if Yale can get a share of the Ivy men's hockey title) Ivy League championships decided, the postseason women's hockey playoffs, critical games in both basketball races and some good early-season spring events. Just so you know, the average Division I school has around 18 teams total, at least according to the NCAA's website. Princeton has 18 who will play this weekend. It's one of the things that's most special about Princeton and the Ivy League. It's a commitment to broad-based athletic participation, as part of the overall educational experience of the athletes. This weekend, there's something for everyone. Let's start with women's hockey. The Tigers have put together one of the best seasons in program history, with a 21-6-2 record that ties the program record for wins, a top 10 national ranking and a home playoff series. The next two goals are to reach the ECAC final four and the NCAA tournament, and it's St. Lawrence - with those two close games - who stands in the way. If you're a Princeton fan, you'll root for St. Lawrence if it gets past Princeton, because St. Lawrence is the school that did the most to start the #14strong social media campaign after Denna Laing's injury. But also if you're a Princeton fan, you're hoping it doesn't come to that. The women's games at Baker will be 3 today, 3 tomorrow and 2 Sunday if necessary. There is no admission charge. There will be admission charged for the men's hockey games, which will be against Yale and Brown, tonight and tomorrow at 7. Princeton will be on the road for the ECAC playoffs next weekend, and the biggest subplot of the weekend will be to see if the Tigers can keep Yale from earning a share of the Ivy League championship, which the Bulldogs would do with a win tonight. A tie or loss and Harvard wins the championship outright. The three Ivy League championships that are up in the air are in men's swimming and diving, men's track and field and women's track and field. The swim meet is at Brown, and Heps indoor track is at Cornell. As usual it figures to be between Princeton and Harvard in the swimming and diving. Princeton is the defending champion in the event and has won five of six. The last time the champion even included someone other than Princeton or Harvard was 1993, when Yale shared the title with Harvard. The last time Princeton or Harvard didn't earn at least a share (obviously before the champion was decided by the championship meet)? How about 1970, when Penn and Yale shared. In men's track and field Princeton hopes to win again, a year after its record-setting win. The last time the winner wasn't Princeton or Cornell at men's indoor Heps? Penn, in 1997. As for the women, Princeton won the cross country championship in the fall, but the Tigers are not the favorite heading into the meet this weekend. Oh, did TigerBlog mention his colleague Kristy McNeil's day tomorrow? She will be at women's lacrosse at 1 against Georgetown, followed by women's hockey at 3 and men's hockey at 7, not to mention all of the social media and everything else for both Heps track meets. For her weekend you can throw in two hockey games tonight and more track and field Sunday. Princeton plays Columbia tonight and Cornell tomorrow, the men home and the women away. Both teams are heading down the stretch of the league races, with five games left, two this weekend, Harvard and Dartmouth next weekend and Penn March 8. Both teams are playing for the championship, and it won't be easy for either one. The women trail Penn by a game, where they've been since the two-point loss to the Quakers in the Ivy opener in January. The men are even with Yale with one loss each, one game ahead of two-loss Columbia (though Princeton still has the extra game against Penn). Columbia is basically playing for its chance, and the Lions have a lot of seniors of who have been pointing to this season. Add to that the heartbreaking loss the Tigers dealt Columbia two weeks ago in NYC, and you know Columbia will be ready to go. There are 18 teams in action this weekend for Princeton. The complete schedule is HERE. TigerBlog recommends women's hockey and then men's basketball tonight. You can get a nosh in between. TigerBlog wants to start today by mentioning five people, unsung people at that. He's hesitant to do this, because Princeton Athletics is mostly a collection of unsung people. They do what they do every day to help Princeton have the best possible athletic program, one that is, for TigerBlog's money, a model of what college athletics can be, with its on-field success and commitment to education and service. So to everyone else, TB apologizes. He knows how important what you all do is to Princeton, and to the athletes, who are the beneficiaries of all of that effort, even if they have no way of ever knowing it, for the most part. Okay, so is TB clear on that? The first person he wants to mention is Milena Flores, the assistant women's basketball coach. As TigerBlog said the other day, Courtney Banghart has put up extraordinary, unprecedented numbers as the head coach of the Tigers. Her record in her last 98 Ivy League games is 92-6, for instance. There's one common denominator for all of the time Banghart has been here, and that's Flores. They started out here together, went 7-23 in their first year together and have been part of five Ivy titles in the last six years together. Banghart is an extraordinary coach, an all-time great at both Princeton and in the Ivy League. But she hasn't done it all herself. Flores has been by her side the entire time, building a program together and, for the last six years-plus years, pushing it beyond anything any Ivy women's basketball program has ever dreamed of accomplishing. The next person is Karen Malec. Karen is the person whose job it is to make sure all of Princeton's home events run smoothly. TigerBlog chronicles the number of these events, and you can go to the all-sports schedule to see just how daunting a task it all is. The toughest times of year are the crossover seasons, when postseason for one season runs into early season for the next. That's basically where we are now. This weekend? There's home men's basketball against Columbia tomorrow at 6 and Cornell Saturday at 6 - with huge Ivy League championship implications. There's the home ECAC women's hockey playoffs against St. Lawrence tomorrow, Saturday and maybe Sunday. There's home men's volleyball. Home men's hockey. Home women's lacrosse. Home fencing. And looming next weekend is the EIWA championships, which will share Jadwin with women's basketball, among other things. And last weekend? Factor in all the Alumni Day necessities in Jadwin to go along with the athletic events. And it all falls to Karen. Next time you're at a Princeton event and you see officials and visiting teams with locker rooms and all the things that make an event actually happen, think of Karen for a minute. The next person is Bill Bromberg, who isn't an athletic department employee but who also has a big effect on Princeton events. Bromberg is the PA announcer for Princeton lacrosse and basketball, men's and women's. He's coming up on 20 years or so of doing this, and he's been incredibly reliable during that time. He's so reliable that TB is willing to overlook the whole "by rule" thing he does with the first called timeout of the second half of a basketball game. Anyway, the crossover season impacts Bill too. This past Saturday, Bill's day began with women's lacrosse at noon at Sherrerd Field, followed by the men's game at 3. Then he had to hustle over to Jadwin for men's basketball. It's not his first triple-header. It is a long day. And as a long-time radio and PA man himself, TigerBlog can tell you that it wears on your voice after awhile. So, yeah, Bromberg earned his "by rule" lines for Saturday. Last but not least, TigerBlog wants to recognize two of his colleagues, Cody Chruschiel and John Bullis. Those two are the video people here in the department, and they have had quite a busy few days of late. They ran into some staggering technical issues last weekend for streaming, and they basically had to reinvent everything Princeton has been doing on the fly. Since then, they've been working like nuts to correct the original problem and ensure that it doesn't happen again. Rather than get flustered and lose their composure, Cody and John simply went step-by-step to solve the problems. Had they gotten heated in the moment, they never would have figured out what to do. The Department of Athletics is made up of people who think that way. Fix the problem. There's always something that comes up around here. One of TB's favorite parts of being here all these years has been the "figure it out" mentality. So those are five people that don't always get the credit they deserve. They're not the only five, and TB is really hesitant to single anyone out because he doesn't want to offend anyone. But these five? They've earned it. It's been awhile since TigerBlog has started out with anything other than Princeton Athletics. Yeah, he mentioned the Super Bowl. And there was BrotherBlog's report from Australia. Mostly it's been all Princeton, all the time. Hey, it's a busy time of year, and there's a lot to write about in Princeton Athletics. And he'll get to it today. First, though, let's talk television. TB can't even remember the last time he talked about a TV show. Was it the last episode of "Homeland?" The new season of "House of Cards" is coming to Netflix soon. Like next week soon. Season 4 starts on March 4. This might be a problem for TigerBlog, who is currently 28% of his way through his current - and most ambitious - binge-watching attempt. Guess what he's watching now? His first binge-watch was Season 1 of "Homeland," but that was just one season. Since then, he's had to watch each of the remaining seasons one episode per week. He had to play catch-up on "House of Cards," "Orange is the New Black," "Lilyhammer" and "Wentworth," four of the great Netflix shows. For those, though, he went through the first few seasons and then had to wait for the subsequent season to launch. His best efforts so far in watching an entire series start to finish have been "Breaking Bad," for which he watched all 62 episodes, and "Parenthood," for which he watched all 103. Those two combined are only slightly more than the 153 episodes of "Gilmore Girls." The show, which ran for seven seasons beginning in 2000, is Miss TigerBlog's all-tie favorite, and it was recently announced that another season is being released. TB decided to see what the fuss is, and now he's sort of hooked. It's not that radically different than "Parenthood," at least with Lauren Graham in the "mother-as-friend" role. "Parenthood" definitely took on some deeper issues, but they can both best described wholesome. Or at least wholesome-ish. TigerBlog's objection to "Gilmore Girls" is the endless banter from the main character. It's funny for awhile. Then it becomes tedious. Oh, and they eat breakfast and dinner every night at Luke's diner, eating pancakes in the morning and burgers at night, and yet they're both rail thin. Other than that, it's a fine 43-minute diversion. TigerBlog is 43 episodes in, leaving 110 to go. Every now and then Miss TigerBlog ruins an upcoming plot twist for him, like telling him that Christopher's new girlfriend gets pregnant right after he looks like he's getting back together with Lorelei. And the show does have one of TB's all-time favorites, the recently deceased Edward Hermann, who always played the same character - stodgy, old-money, bowtie, sophisticate. Rory, Lorelei's daughter, wants to go to Harvard. Through the first two seasons she is at Chilton school, a fictional ritzy Connecticut prep school somewhere near Hartford, which makes TB think that she has gone to Rein's Deli in Vernon more than once. Maybe she even got the Boston Harbor sandwich that TB loves - whitefish salad, lox, onions, tomato. There is one episode where Rory and Lorelei take a visit to Harvard's campus. TB is pretty sure that it wasn't really filmed at Harvard. As he understands it, Harvard has not allowed anyone to film on its campus since "Love Story." Miss TigerBlog has already told her dad that Rory ends up at Yale, not Harvard. And Lorelei, in real life (as in Lauren Graham), is a Columbia grad. And so between fictional Rory, real life Lorelei and TigerBlog, you have the Ivy League men's basketball race. Perhaps Lauren Graham will be checking in to see how her alma mater does in men's basketball Friday night, when it takes on Princeton in Jadwin Gym in the latest huge game in the Ivy race. Hmm. That's sort of an interesting question. TigerBlog has wondered this before, back in 2009. Do famous people check out goprincetontigers.com? Maybe Lauren Graham is really invested in Columbia basketball. If she is, she already knows how big this weekend is. Right now you have Yale at 9-1, Princeton at 8-1 and Columbia at 8-2. All three know this: win out and earn at least a share of the championship. None of those three has lost a game to the other five teams to date, and the race has been defined so far by the head-to-head meetings between the three. So far, Princeton is the only one to have won on another's home court, having beaten Columbia in New York City two weeks ago. Columbia is home with Yale on March 5, the final night of the regular season for both. As TB said, each of the three gets at least a share of the title by winning out. Columbia would get to 12-2 by doing so and in the process deal Princeton and Yale another loss, giving them at least two each. It'll be a three-way tie at 12-2 if Columbia wins out and Princeton and Yale win the rest of their games other than Columbia. There are a million permutations right now. Well, not a million, but a bunch. There's even one for a four-way tie: Penn goes 5-0 to get to 9-5, Yale goes 0-4 to get to 9-5, Columbia goes 1-3 the rest of the way to get to 9-5 and Princeton goes 1-4 the rest of the way to get to 9-5. Likely? No. But possible. The other four teams, by the way, are all mathematically eliminated. But still important to determining the champion. Between them, Princeton, Columbia and Yale have nine games remaining against the other five teams. Not one of those games is going to be easy, and each will impact the league race. In the next two weekends Princeton has to go to Harvard and Dartmouth and play Cornell here Saturday. Columbia has to play at Penn. Yale has Harvard and Dartmouth at home. And that doesn't even take into account how much joy Penn would take in derailing Princeton on March 8 here at Jadwin. Remember when Princeton did it to Penn a few years ago? Of course, the biggest game of any year is always the next one. And in this case, that's even truer. Princeton hosts Columbia Friday night. You don't have to be a math genius to understand the impact a Princeton win or a Columbia win will have on the race. The Princeton men's basketball team has been exciting to watch from Day 1 this year. The Tigers are stalking the school record for points per game in a season. They have players who push the ball and play at a fast tempo and are exciting to watch. And they're playing for a championship. You can't ask for much more for the final weekend in February at Jadwin Gym. Courtney Banghart went 4-10 in the Ivy League in her first year as Princeton's head women's basketball coach. She went 9-5 the next year, leaving her 13-15 for her first two years. When Princeton defeated Brown Saturday night in Providence, Banghart reached her 100th Ivy League win at Princeton. How many losses does she have? Well, her record is now 100-21. That makes her 87-6 in her last 93. Actually, going back to the end of her second year, she's really 92-6 in her last 98 Ivy games. That, TigerBlog suggests, is nuts. Yes, TigerBlog mentioned that yesterday. It's such an impressive stat that he wanted to mention it again. Compare Banghart's record with another Princeton coach. This coach was 2-10 in his first 12 Ivy games. He then went 68-5 in his next 73. Any guesses on who that coach was? TigerBlog will give you a few paragraphs to think about. By the way, no Ivy League basketball coach - men's or women's - has come close to winning 87 of 93 league games. Bill Carmody had a great four-year run at Princeton, going 50-6. To equal what Banghart has going now, he would have had to win his next 42 straight had he stayed at Princeton. Butch van Breda Kolff's best run with six losses was 46-6. Again, what Courtney has done is ridiculous. Oh, the other Princeton coach TigerBlog referenced above? Bill Tierney. Anyway, that's a little more on Courtney's accomplishment. For another accomplishment, there's Cecilia Barowski of the women's track and field team. This past weekend at the Princeton Invitational, Barowski ran a 2:04.66 for the 800. That just happens to be the third-fastest time in the nation this indoor season. Barowski has been an indoor and outdoor Heps champ, most recently the indoor 800 last winter. She went on to be an outdoor All-America in the 800 as well and holds two individual school records while being part of five school-record-setting relays. This is indoor Heps week, as the Ivy League championships will be held at Cornell Saturday and Sunday. Also later this week will be the ECAC women's hockey quarterfinals at Baker Rink. Princeton, the Ivy League champ, is the third seed in the ECAC tournament and will host St. Lawrence in a best-of-three beginning Friday. Game times are 3 Friday, 3 Saturday and 2 Sunday if necessary. Admission is free. If you haven't been to women's hockey this year, make sure you get out there. The team has been fun to watch and is having a great year. The first goal, TB surmises, is to win the Ivy title in women's hockey. Done. The second goal? A home playoff series. Done. This has put Princeton in position to achieve some of its bigger goals, and the biggest goal of all, a spot in the NCAA tournament. Princeton has been there once, in 2006. The current Tigers have tied the school record for wins in a season with 21, and they bring a record of 21-6-2 into the postseason. Princeton went 14-6-2 in the ECAC, finishing behind Quinnipiac and Clarkson. Should Princeton beat St. Lawrence, it would probably get Clarkson (who plays RPI) in the semifinals (single elimination). TB doesn't know a lot about it, but he's guessing that a win over St. Lawrence and then a loss to Clarkson puts Princeton right on the bubble. Beating both and reaching the final probably makes Princeton an NCAA lock. Before Princeton can think about any of that, it has to get past St. Lawrence. The teams split their regular season games, each with a win at home, by one goal. So yeah, it won't be easy. A good crowd at Baker would help. Did TB mention that it's free? So those are the accomplishments of Courtney, Cecilia Barowski and the women's hockey team. One more from this weekend - the women's lacrosse team opened its season against Virginia, who came to Sherrerd Field ranked fourth after a big win over Northwestern. Princeton was playing its first game, though you couldn't tell by the weather, which was much more April or May than February. The Tigers defeated UVa 14-7, as nine different players scored at last once. Actually, if you couple that with the men, then 21 different Princeton lacrosse players scored at least once on opening weekend. The key moment in the game was just before the end of the first half. The game was tied at 5-5 when Stephanie Polascio scored with nine seconds left in the half. Princeton then won the draw, and Elizabeth George just beat the buzzer, making it 7-5 at the break. It was 7-2 Princeton in the second half. The Tigers are at Drexel tomorrow night and then home with Georgetown Saturday. The Ivy season starts the following weekend, when Dartmouth is here. Ah, crossover season is here. Hopefully this one stretches out for awhile, with some postseason rewards for regular season accomplishments. So another weekend has come and gone, and the Ivy League basketball races are even more interesting than they were a week ago. In the entire history of Ivy League women's basketball, there has never been a season where two teams went 13-1, splitting with each other, and then met in a playoff game. The last game of the season has never come down to a game between a 13-0 team and a 12-1 team, for that matter. On the men's side, there have been two 13-1 ties. The first time was in 1959, when Dartmouth beat Princeton in Hanover and six days later, Princeton beat Dartmouth in Dillon Gym. The other time was in 1981, when Princeton beat Penn in Jadwin early in the league season and Penn beat Princeton less than a month later at the Palestra. Now, with two weekends and then the Princeton-Penn doubleheader at Jadwin Gym on March 8 to go, the men's and women's races are still wildly up in the air. The possibility still exists for not just one but two 13-1 ties, though they are anything but certainties at this point. Princeton's men did their part to make it a race with their scintillating 75-63 win over Yale Friday night and then commanding 77-66 win Brown Saturday as 7,000 fans made their way to Jadwin. About two weeks ago, it seemed like Princeton's season would be defined in a six-day stretch, when the team would play at Columbia and then home with Yale. What happened? Princeton had its incredible rally to beat Columbia in overtime last Saturday in New York City and then handed Yale its first league loss Friday at Jadwin. Oh, and Devin Cannady in those two games? Well, his numbers for those two games were: 21.5 points per game, 13 for 19 from the field, 6 for 9 from three. He also had two moments that transcended the numbers. First was his eight-points-in-25-seconds masterpiece to force OT against Columbia. Then it was his behind-the-back move to the basket for a layup against Yale, one that did two things: 1) announced his presence on the game and 2) ended up SportsCenter top plays of the day. When TigerBlog was in the newspaper business, the men's basketball head coach at the College of New Jersey was a man named Donnie Marsh, who used to say that the toughest thing to do was win the game after the big game. Princeton-Yale was the big game this weekend; both came back with big wins Saturday. And then there's Columbia, who swept Harvard and Dartmouth. In case you're keeping score, Princeton, Columbia and Yale won all of their games against other teams this weekend by double figures. So that leaves the standings at Yale at 9-1, Princeton at 8-1 and Columbia at 8-2. Penn is next at 4-5, and while the Quakers are still mathematically alive (everyone else is eliminated), it's safe to call this a three-way race. Columbia is at Jadwin Friday (Cornell is there Saturday). Yale is at Columbia on the final day of the regular season for both. There can be an outright championship. Or co-champs, even at 13-1. Or a three-way tie, which would be the first since Princeton, Penn and Yale in 2002. Right now, the three contenders are a combined 21-0 against the rest of the league. Of course, the other five teams would like nothing more than to destroy the championship hopes of the other three, and no game is a gimme. It's going to make for a crazy two-plus weeks. Well, Penn and Princeton continued to roll, going 4-0 against Brown and Yale with a combined victory margin of 77 points. Princeton and Penn are 16-0 against the rest of the league, with 15 of those 16 wins by double figures. As a side note, Saturday's win over Brown was Courtney Banghart's 100th Ivy win at Princeton, against 21 Ivy losses, 10 of which came in her first year and 15 of which came in her first two years. This is Year 9 for her. That means she's had six in the last six-plus years. The standings on the women's side show Penn at 9-0 and Princeton at 8-1. It doesn't drop off the table from there, as Harvard is 7-3 and Dartmouth is 6-4, both riding four-game winning streaks. Princeton and Penn are at Columbia and Cornell this weekend and then home with Dartmouth and Harvard the following weekend, before their showdown at Jadwin on March 8. Again, another crazy two-plus weeks. There's a doubleheader at Jadwin Gym two weeks from tomorrow. Will Game 1 be 13-0 against 12-1? Will Game 2 to be to force a playoff, win an outright championship, force another 13-1 vs. 13-1 game? TigerBlog has been following Ivy basketball closely for more than 30 years. This year is one of the best he's seen. Oh, and did he mention the possibility of getting two bids to the NCAA tournament, for the men and/or the women? Devin Cannady's game-tying shot at the end of regulation last Saturday at Columbia became even more impressive to TigerBlog the other day, when Cannady filmed a video in advance of tonight's showdown against Yale. The premise of the video was to see how many times it would take Cannady to successfully recreate that shot. He said he could do it in one take. It took four. You know what that means? That Cannady is better under the pressure of the big moment than he is making a fun video a few days later. Of course, you'd rather have a player who swished it from 27 feet Saturday night with three seconds left down three rather than someone who would make four of four on a Wednesday afternoon in a quiet gym. That same gym won't be quiet tonight, not with Yale in the building. Yale enters the game at 8-0 in the Ivy League. Princeton is 6-1, its lone loss to Yale by a 79-75 count in New Haven. Next up is Columbia, a 6-2. Nobody else is over .500. Princeton would have had two losses, rather than Columbia, had Cannady not scored eight points in the last 25 seconds of regulation, tying it with a long three with three seconds left. And then the freshman put Princeton ahead for the first time all night in the final minute of the overtime, after the Tigers had trailed by seven. Princeton, Yale and Columbia are 16-0 against the rest of the league. Going head-to-head among the three, Yale is 2-0, Princeton 1-1 and Columbia 0-2, with one more game between each of them. The advantage that Princeton has is that both of its return games are at home, starting with tonight. Columbia gets Yale at home in the final regular season game for both. Yale shot 11 for 19 from three-point range in the win in New Haven. In fact, Yale is shooting 44% from three-point range at home and 32% from three-point range on the road, and that's a huge theme for this game. Princeton is playing its third home Ivy League game. In its first two, Princeton shot 52.6% from the field and 45.2% from three-point range, averaging 12.5 made threes per game. In its five road games? Princeton is at 34% from three-point range, with 7.6 made per game. Overall Princeton is at 43.7% from the field away from home in the league. Of course, even with those numbers, offense hasn't been an issue for Princeton. The 2015-16 Tigers are threatening the school record for points per game in a season, with a 79.62 average that is just off the record of 79.74, set in 1971-72. The 1971-72 season is also the last time Princeton reached at least 80 points in four straight games, something that Princeton has now done in its most recent four. That's not the record, by the way: the 1965 Final Four team did it six straight times once. Oh, and speaking of the 1971-72 team, those Tigers didn't do it in the Ivy League. The four opponents Princeton reached at least 80 against in a row? How about California, Kentucky, Stanford and Michigan. The Princeton teams of the early Pete Carril years (his first season as Tiger coach was 1967-68) routinely scored in the 80s and 90s. Keep in mind that this was without a shot clock or a three-point line. Why? TigerBlog has never asked Carril. Or Gary Walters. Perhaps he needs to. TigerBlog does know that Carril's coach at Liberty High School in Bethlehem was a man named Joseph Preletz, and he liked to press and play up-tempo the whole game. And the last of Carril's college coaches was Butch van Breda Kolff, who would go on to coach Princeton during the Bill Bradley years. Anyway, the Yale game is a big one. Win or lose, Princeton will have to bounce back quickly, taking on Brown Saturday at 6. While the men's basketball game is a big one, it's far from the only big game at Princeton this weekend. The Ivy League women's swimming and diving championships continue today and tomorrow at DeNunzio Pool. The women's hockey team is at home, hoping to be here next weekend as well, when the ECAC playoffs start. The Tigers, who play RPI tonight at 7 and Union tomorrow at 4, need two points to clinch home ice for the playoffs. Princeton can still finish as high as second and as low as fifth. This is also the real start of the crossover between winter and spring, and not just because it's going to be nearly 60 degrees here tomorrow. No, this is opening weekend for women's lacrosse, men's lacrosse and softball, with men's tennis also on the schedule. The lacrosse season began last year in shivering temps and snow. The 2016 season will start on what figures to be a beautiful day. And it starts in style. The women, ranked 10th, host No. 5 Virginia at noon, followed by the men against NJIT at 3. NJIT is in its second year as a Division I program, the fourth in New Jersey. Admission to the lacrosse doubleheader is free. You have to buy a ticket to the basketball game tonight, but it's worth it. By the time the rowing championships end in the spring, the Ivy League will have awarded champions in 33 different sports, as it does every year. Right now, the winner has been decided in 13 of those sports. There have been nine outright champions, one co-championship and three tri-championships. Princeton has won seven championships to date: field hockey, women's soccer, women's cross country and women's hockey outright, women's volleyball co-champion and men's and women's fencing tri-champion. As for the rest of the league, three other schools are tied with three Ivy titles each to date. Ivy championships are interesting things. As you know, they are not all awarded in the same manner - round robins, double round robins, championship meets - and it can take anywhere from a few minutes (cross country) to two different calendar years (hockey) to win one. One thing TigerBlog likes is that the regular-season champ is considered the champ, even in situations like lacrosse where there is a tournament. And if there is a tie, then there are co-champs, as opposed to a tie-breaker. Now, TigerBlog knows what people say about this. It depends, TB supposes, if your team would have won the tiebreaker. The fact that 13 Ivy sports have crowned their champions means that there are seven more for the winter and then 13 in the spring. The men's hockey championship figures to be between Harvard and Yale, with the Crimson one point up with one league game each left (Harvard vs. Cornell, Yale vs. Princeton). The basketball races are basically between two teams on the women's side (Princeton trails Penn by one game) and three on the men's side (Princeton and Yale with a huge one tomorrow night, with Columbia hoping for a Princeton win). There are three to be decided next weekend, when the indoor track and field Heps are at Cornell and the men's swimming and diving championships are at Brown. And that leaves women's swimming and diving, which will be held at DeNunzio Pool. It actually starts today, with preliminaries at 11 and finals at 6, and continues with the same schedule tomorrow and Saturday. TigerBlog doesn't know much about swimming and diving, other than in championship meets it's all about depth and figuring out ways to maximize points. It is, he understands, quite a challenging puzzle to put together. Princeton is the defending champ. The Tigers rallied a year ago from a big deficit on the final day, but TigerBlog isn't sure if that's the same as a big rally in a football or basketball game. It could be that the Tigers knew that they had big points coming up. TB isn't sure. You know who would know? Princeton head coach Susan Teeter. The championship last year was her 16th at Princeton. There aren't too many Ivy League coaches who have won more in any sport. As for the chase for her 17th, Yale went undefeated in the dual meet season, swimming and diving is one sport that awards its title to the winner of the championship meet, not the dual meets. It figures to be a three-way battle between Princeton, Yale and Harvard. One thing TigerBlog does know about the meet is that he will be one of the presenters of the awards after one of the races, something he will be honored to do. TB's event, as it were, is the 100 backstroke. He'll be rooting hardest for Princeton in that event. It figures to be another competitive championship weekend at DeNunzio. If you're going to basketball, you might want to check out some of the swim meet as well. Some of the best celebration pictures and videos you'll ever see come from after the swimming and diving championships. You've seen them. Everyone's in the pool. The coaches get tossed in in their clothes. It'll come Saturday night at DeNunzio. Will it be Princeton, Harvard or Yale? TigerBlog went to the start of women's basketball practice Monday to meet up with a television crew that was going to be there to do a story on the Tigers. Then it snowed, and they never showed up. That was okay. It gave TigerBlog a chance to experience the great center of activity that Jadwin becomes on your average weekday at 4:30. The women were on the main court. The men were on a side court. Track runners were everywhere, kept inside by the snow. The cheerleaders were practicing as well, out in the lobby. Oh, and the track runners? They kept running laps, out one door, through the lobby, back in the other door, around the track and back around. That has to get dull after awhile. Indoor track practice is quite a sight. There are athletes everywhere, men's and women's. They are doing different things at the same time in a small space, and TigerBlog is always amazed when he sees the choreography of it all. Amanda Berntsen was the first women's basketball player out on the court, and she was doing an interesting warm-up exercise. She had a tennis ball and a basketball, and she was dribbling the basketball while sort of juggling the tennis ball. It reminded TigerBlog of the basketball tricks that Pete Maravich used to do. He was famous for THESE. By the way, if you never saw Pete Maravich play, you missed something really special. He's not considered among the greatest basketball players ever, but he was way, way, way up there on the list of great scorers. Actually, in college, nobody - absolutely nobody - was ever a better scorer. In fact, can you name the top three all-time leaders in points per game in a season in Division I men's basketball? Yes, Maravich played for his dad, Press Maravich. And yes, it was all about how many points "Pistol Pete" could put up. But hey, that's a ton of points. And that's with no three-point shot. In all, he put up 3,667 points, the most ever in Division I history. Second place is 418 points shy of Maravich, and that was from Freeman Williams of Portland State, who played four years. Second place among three-year players is Oscar Robertson, who had 2,973 points while at Cincinnati. That's 694 fewer points than Maravich. About the most incredible way TigerBlog can put it is to say that Maravich scored 1,164 points more than Bill Bradley, whose 2,503 points rank 10th all-time among three-year players. Bradley, of course, has basically made updating the Princeton record book irrelevant, as his 2,503 points are 878 more than Ian Hummer, who is in second place. Taking the math a little further, then Maravich scored 2,042 more points than the second-place scorer at Princeton. So where was TigerBlog? Oh yeah, Maravich. Amanda Berntsen. While TigerBlog was on the court Monday, he saw two basketball alums, one women's and one men's. The women's alum was Blake Dietrick, the 2015 Ivy League Player of the Year. She came in, hugged a bunch of players and coaches and then watched practice. The men's alum was Darren Hite, Class of 1998, which makes him a classmate of current head coach Mitch Henderson and a teammate of current assistant Brian Earl. Hite came to Princeton from Mater Dei High School in California, and he was a part of three Ivy League championship teams and two NCAA tournament wins. His senior year saw Princeton go 27-2 and move into the Top 10 nationally in the rankings. Hite has always been a TigerBlog favorite. As it turned out, he just turned 40, which is somewhat shocking to TigerBlog, who met Hite when he was still a teenager. Hite and Henderson were shooting around, and Hite was actually making as many as he missed from the three-point line. Well, almost as many. Henderson was making more than he missed. It was a light moment between the head coach and an old friend. Then it was back to work for Henderson, as he prepares his team for the showdown Friday against Yale. The women's race shows all signs of building to the March 8 game between Penn (7-0) and Princeton (6-1). As TB said yesterday, Princeton and Penn are 12-0 against the rest of the league, with 11 of 12 wins by at least 15 points. Harvard and Cornell are both 5-3, and they play each other Saturday, which guarantees a fourth loss for one of them. And they both still have Princeton and Penn to play again. So while they're not out of it, there is no margin for error for them. Or, really, for Princeton, if you assume Penn isn't going to lose again before March 8, which is an assumption Princeton needs to make at this point. As for the men, it's been a series of huge games weekend to weekend. First there was Princeton-Yale. Then there was Columbia-Yale. Last week it was Princeton-Columbia. And this weekend, it's Princeton-Yale, Friday night, at 7, in Jadwin. Yale is the lone Ivy unbeaten at 8-0. Princeton is in second at 6-1 after its wildly dramatic game Saturday night in which it came back twice to beat Columbia 88-83 in overtime. Columbia is 6-2. Nobody else is over .500. Yale still has to play at Columbia, which it will do in its final regular season game. Columbia is at Princeton next Friday. But first, there's Friday. The math is obvious - a Yale win and the Bulldogs are two up on both Princeton and Columbia, while a Princeton win basically makes it a tie race. It's a huge one, and Jadwin figures to be buzzing for the game. You know, a different kind of buzzing than it was earlier in the week. Denna Laing spoke to the crowd at Baker Rink before Saturday's women's hockey game against St. Lawrence. Well, not directly. It was recorded. It didn't matter. It was still amazing to hear the strength in her voice, all the way to the end, when she said "and last but not least, go Tigers." Laing, as you probably know, is the Princeton women's hockey alum who suffered the massive spinal cord injury while playing professionally, in the Women's Winter Classic on New Year's Eve. The game Saturday was part of Denna Day, one that included different fund-raising events to help with Laing's medical costs. TigerBlog's contribution was one of the #14Strong winter hats. It's very comfortable, by the way. The first highlight of the day was definitely Laing's voice, which sounded so confident and so upbeat that it "gave me chills," said Princeton head coach Jeff Kampersal. The last highlight was supplied by Kelsey Koelzer, who rocked a goal in overtime to give Princeton a 4-3 win. It was a huge one for the Tigers. John Thompson, when he was the men's basketball coach at Princeton, used to say the goal of each weekend was to get through it still able to achieve whatever your goal is without having to get any help from anyone else. That's TigerBlog's paraphrasing, but you get the point. The women's hockey team achieved that this past weekend, even after its tough loss to Clarkson Friday night. Princeton - who has already won the 2016 Ivy League title - enters the final weekend of the regular season with 27 points, tied with Colgate for third place, two points back of second-place Clarkson. Quinnipiac is in first, with 32. The top four teams in the league will get home ice for the playoffs. Harvard is in fifth, with 25, so Harvard is still alive for home ice. St. Lawrence and RPI are tied for sixth with 20, which means they cannot play at home. Princeton hosts RPI Friday and Union Saturday. Union is 12th in the league, with an 0-17-3 ECAC record. Harvard is at Colgate and Cornell. What are the tiebreakers? Apparently, it's head-to-head, which is good for Princeton if it stays the way it is now, since the Tigers swept Colgate. Should Princeton beat Union, then the Tigers would have at least 29 points, meaning Harvard would have to get two wins to tie the Tigers, with whom they split. What would the tiebreaker be then? Wins, which would also favor Princeton. What does it mean? TB is pretty sure it means that if Princeton beats Union, it'll be assured of home ice for the playoffs, regardless of what else happens. Another team that had a good weekend by John Thompson's standards is the women's basketball team. Princeton entered its game Friday against Cornell in a three-team race for the league championship, even with Cornell with one loss, behind unbeaten Penn. Now it looks like a two-team race, after Princeton and Penn won their four games this weekend by a total of 87 points (including matching 71-51 wins Friday night). Penn is 7-0 in the league. Princeton is 6-1. Everyone else has at least three losses. Princeton and Penn are a combined 12-0 against the rest of the league. Of those 12 wins, there have been 11 by at least 15 points. Princeton and Penn are at Yale and Brown next weekend, at Columbia and Cornell the following weekend and then home against Harvard and Dartmouth before their season-ending showdown on March 8 at Jadwin. Will it be 13-0 against 12-1? It was a busy weekend for Princeton Athletics, and TB doesn't want to shortchange anyone. He does want to mention Cecilia Barowski of the women's track and field team, who ran a school-record 54.39 in the 400 on Staten Island Saturday. And then there's the wrestling team. Princeton defeated Columbia Saturday afternoon to set up a winner-take-all showdown against Cornell Saturday night for the Ivy title. And even though Cornell won 23-16, what Princeton has accomplished is astonishing. Think about it. Would you have believed 10 years ago that Princeton would wrestle Cornell for the league crown? How about three years ago? Congratulations to Chris Ayres and the entire wrestling program. Their day, TB is fairly confident, is coming. There's a parking garage with an entrance at 118th Street off Amsterdam Ave., in New York City. TigerBlog has parked there many times. From that garage, there's a walk through a path that is framed by some dumpsters and the back ends of some buildings. At the end of the path is the entrance to Levien Gym, the home of Columbia basketball. The walk from the garage to the building is about five minutes, and on the wrong winter night, it is a really cold five minutes. TigerBlog has some pretty fond memories of the 15 or so times he saw Princeton play at Levien Gym in men's basketball. He was thinking back to those times as he watched Saturday's Princeton-Columbia game. And why not? The game saw Princeton dig an early hole that seemed insurmountable, and no matter what, Princeton couldn't get closer than six or eight or so. TigerBlog was left to remember other nights in the building, since this one seemed lost. The key word in that paragraph, used twice, is "seemed." Actually, it would have been insurmountable had Devin Cannady not turned in about six of the greatest minutes any Princeton basketball player has had in the last, oh, very, very long time. Cannady finished with 23 points, of which eight came in the final 25 seconds of regulation in what was a surreal stretch of basketball. It started when Columbia led 73-68 with 29 seconds left after a pair of made free throws. Then Cannady needed only four seconds to go end to end and float in a shot to make it a three-point game again. Then, after Columbia made one and missed one to go up 74-70, Cannady caught the ball in transition, took a step back to make sure he was outside the arc and the swished a three, making it 74-73 with 11 seconds left. Columbia then scored on a layup, making it 76-73. Was it over? Hardly. That's when Cannady made his most startling, did-he-just-do-that play, dribbling up and without flinching launching one from way beyond the three-point line. Swish. Game tied, to overtime. That was eight points in 25 seconds. Can anyone top that? Oh, and when TigerBlog mentioned that this was the most critical moment of Princeton's season, to date at least, he meant it. Yale had already defeated Harvard, leaving the Bulldogs unbeaten. The loser of the Princeton-Columbia game would have two league losses, while the winner would still only have one, since Princeton and Columbia had both lost at Yale. Princeton's next game is Friday at home against Yale. Had Cannady not gone off in those 25 seconds, Princeton would have been two back, rather than one, when the Bulldogs come to town. Cannady, though, wasn't done when the Columbia game went to overtime. Again Columbia pulled away, leading 83-76 with 2:12 left. Again Cannady brought Princeton back, first with a basket and foul shot to make it 83-79 and then, after a Steve Cook three-point play, another basket in the lane that gave Princeton the lead at 84-83. By the way, that was Princeton's first lead since 2-0. Columbia would actually lead for more than 42 minutes in this one. Cannady wasn't the only one who came up big for Princeton. Pete Miller had a career-high 20, with 13 rebounds, on 9 for 10 shooting, and were it not for the big man, Columbia would have been up by 20 or more. Miller, though, picked the wrong night for his best game. This one will always be remembered as the Devin Cannady show. He was incredible. He combined raw physical talent with sheer determination, and it added up to a "I'm not letting us lose" moment. It's not something that can be taught or learned. It's something a player either can do or can't do. Put Cannady in the "can do" category. And because he did, Princeton had a huge win in a huge game. Its prize, by the way, is an even bigger game Friday. TigerBlog speaks today about two women - one he's never met, another he'll never forget. It was seven years ago today that Lorin Maurer died, one of those who tragically was taken in a plane crash outside of Buffalo. She was a few weeks past her 30th birthday. Lorin worked with Princeton's Athletic Friends groups. As each year passes, fewer and fewer people here in the Department of Athletics remain who worked with Lorin. TigerBlog would like to make sure that those who didn't know her learn something about her. And, in the process, he hopes that those who did know her will take a minute to remember her. Lorin had a great spirit for life. She smiled and laughed easily and regularly. She was easy to work with, and she was happy to help anyone with any project or task that came up. On the day she died, Lorin was at work in Jadwin Gym. She and TigerBlog were in the same meeting. As TB remembers it, Lorin mentioned a few times during the day that she'd have to cut out early, that she was off to a wedding in Buffalo. TB thinks she left a few minutes before the meeting ended, and TigerBlog had just gotten back to his office. In all the years that the Office of Athletics Communications was up on the balcony of Jadwin, TigerBlog's door was almost always open. That day was no exception. Some people would walk by and say hi. Others would walk by and not look in. Lorin would always, always, always stop in the doorway. If she had nothing to say, she'd just smile and then keep going. She did the same thing that day, seven years ago. She stopped, didn't say a word, smiled and went off on her way, as it turned out, to a tragic destiny. TigerBlog went about his business that night, completely unaware of what had happened with Lorin's plane. It wasn't until he woke up the next morning that he was hit with the news. Now, seven years later, he can still remember the feeling. It was the single most stunning moment of his life. Lorin Maurer, so full of life, so young, was gone. TigerBlog could barely process it all. It seemed so unreal, unbelievable, unfathomable. He stared at the computer and the television, not willing to accept that this was possible. Sadly, tragically, it was. Princeton had basketball at home that night. The game was swarmed by reporters asking about Lorin, asking to film in her office (which had been on D level), asking people who knew her what she was like. It was a blur then. Today, every detail is seared into TB's mind. When TigerBlog thinks back to Lorin, he thinks first of her spirit. She may have been robbed of so many years of her life, but her spirit still lives on in those who knew her. Certainly TigerBlog will never forget her. TB knew Lorin Maurer. He's never met Denna Laing. He doesn't need to know that she's a woman of extraordinary spirit as well. By now you know Denna's story. A former women's hockey player at Princeton, Laing suffered a terrible spinal cord injury on New Year's Eve while playing for the Boston Pride of the women's professional league at the Women's Winter Classic in Foxboro. Laing has been moved from the hospital to a rehab center, and by all accounts she has been making incredible progress. Laing has been active on social media, sharing videos of her progress and inspirational messages for those who have become her followers. The hashtag #14Strong refers to her uniform number with the Tigers (she wears No. 24 for the Pride), and it has become something of a social media phenomenon to see teams form the No. 14 and send it to her. It started with the St. Lawrence women's hockey team, to whom Laing had no actual connection to other than having played against the Saints. It spread quickly, eventually being picked up by teams in other sports and by several Princeton teams. The women's hockey team, which has already won the Ivy League title, plays at home this weekend as it chases home ice in the ECAC playoffs. The Tigers host Clarkson tonight at 7 and then St. Lawrence tomorrow at 3, and the game tomorrow is part of "Denna Laing Day." Among the events at the women's game tomorrow will be the sale of "14Strong" hats, a bake sale and a chuck-a-puck contest. Donations for the Denna Laing Fund will be accepted as well. Through all of this, Laing's attitude has been incredible. TigerBlog has not seen any picture of her where she wasn't smiling. Anything she has said has been amazingly positive and talks about how she'd never change a thing. In the most recent video TB saw of her, Laing was moving her arms easily, freely. It was really great to see. Like Lorin Maurer's, Denna Laing's spirit leaps out at you. Like TB said, he's never met her, never talked to her. But he is inspired by her. If you never met her, she was someone special, a real shining light for Princeton's Department of Athletics. If you have met her, you know exactly what TigerBlog means. According to the Ivy League website, there have been six instances in Ivy League athletic history when a school has won at least 10 consecutive titles in the same sport. Of those six, they are split evenly between two schools - three for Princeton and three for Cornell. Any guesses on what Princeton's three are? Want a hint? Nah. Of the three for Cornell, two are men's gymnastics, which the Big Red won from 1968-77, and men's lacrosse, from 1974-83. In case you're wondering, Ivy League men's gymnastics was discontinued after the 1982 season. Women's gymnastics, by the way, lasted until 1990. TigerBlog will get back to Cornell's other one in a few minutes. In the meantime, there are Princeton's three. One is men's lacrosse, which Princeton won from 1995 to 2004. Princeton did not win the Ivy League championship in 1994, losing to Brown during the season, but the Tigers did win the NCAA championship that year, avenging the loss to Brown in the semifinals along the way. The other two for Princeton are really one, field hockey. Princeton has won 20 of the last 21 Ivy field hockey titles, winning 10 straight from 1995-2004, losing in 2005 and then winning 10 more in a row, a streak that is active. TigerBlog was at the game that Princeton lost to Penn in 2005. It was the season finale, and it was a three-way race where the winner of the Princeton-Penn game at ’52 would tie Harvard for the title. The Princeton-Penn game was tied, when Penn got a penalty corner as the final seconds ran off. In field hockey, the offensive team can take its time in that situation, because it gets to play out the corner. If there's another corner called off the first one, that one gets played out too, even though the clock shows all zeroes. TigerBlog is pretty sure soccer doesn't work that way. That's why you see players sprinting to get corner kicks off in the final seconds of a half. Anyway, Penn scored off the corner. That's the only time in the last 21 years Princeton has not won. So where were we? Oh yeah, the other Cornell streak. That one is actually active. It's the current 13-year run of the Big Red in wrestling. Since losing to Penn in 2002, Cornell has run the table, not only winning the title each year but also being perfect along the way. Cornell's run has been impressive, as the Big Red have come close to winning the NCAA title as well. For years, the Tigers struggled to field a full lineup for wrestling, let alone win team matches. The idea that Princeton would emerge as a legitimate Ivy League contender wasn't something that was really considered. All of that brings us to this Saturday. Princeton hasn't won an Ivy League wrestling championship since 1986, long before any of the current Tigers were born. Princeton hosts Columbia and Cornell Saturday at Dillon Gym. The Columbia match is at 1; Cornell is here at 7. The Big Red begins its day in Philadelphia, wrestling at 1 at Penn. This is the final weekend for the Ivy race. The standings currently have Penn at 2-1, Columbia at 1-2, Harvard at 1-3 and Brown at 0-4. And at the top, tied at 3-0? Princeton and Cornell. TigerBlog has said this before, but the job that the Princeton wrestling coaching staff has done in recent years has been nothing short of incredible. They've engineered one of the great turnarounds TigerBlog has seen in any sport here in all of the time he's been here. Hey, you can tell it just by walking past the wrestling room on E level of Jadwin on any given afternoon. The intensity and competitive spirit that blasts out of that room is obvious. In reality, Princeton wrestling is still on the way up. Its best days are still to come. Cornell is a huge favorite this weekend still. But look where Princeton has gotten. The year that the current Cornell streak began saw Princeton go 0-5 in the league. There would be six more 0-5s, with one 1-4, in the next seven years. As recently as 2011, 2012 and 2013 Princeton went 1-4, 1-4 and 0-5. Then it was back-to-back 3-2s, and now a shot at the championship. Princeton has certainly danced on the edge this year. Its three Ivy wins have come down to the last match each time. Still, 3-0 is 3-0. And the Tigers are 3-0 heading into the final day of the regular team season. It's a huge Saturday on the mat at Dillon Gym. It's the biggest day of Princeton wrestling in a long time. TigerBlog spent a good deal of his Saturday wondering if he was working. He was at work. He knows that. He's just not sure if he was working. For most people, TB presumes, it's easy to tell if they're working. For him, it's not quite as clear cut. He was at Princeton from around noon until eight or so. During that time, he saw squash, tennis and basketball, and the men's lacrosse scrimmage. He didn't write any stories. He just watched, taking it in. That's what he does for fun. When you work in college athletics, that's what you do. The whole point of everything you do is to enhance the experience that the athletes have, so why not go to the games? As he says, that's the fun part. It's easy to forget that most people don't go to their own offices and hang out there for entertainment, right? Certainly BrotherBlog doesn't. At least TB presumes he doesn't. BrotherBlog is a lawyer in Seattle. He teaches at the University of Washington Law School, his alma mater. His original alma mater is the same as his brother's, Penn. TigerBlog isn't sure how many times BB has been to the Palestra in his life. He's not quite the Ivy League sports fan that his brother is. Every now and then, though, he likes to go to a game or two. 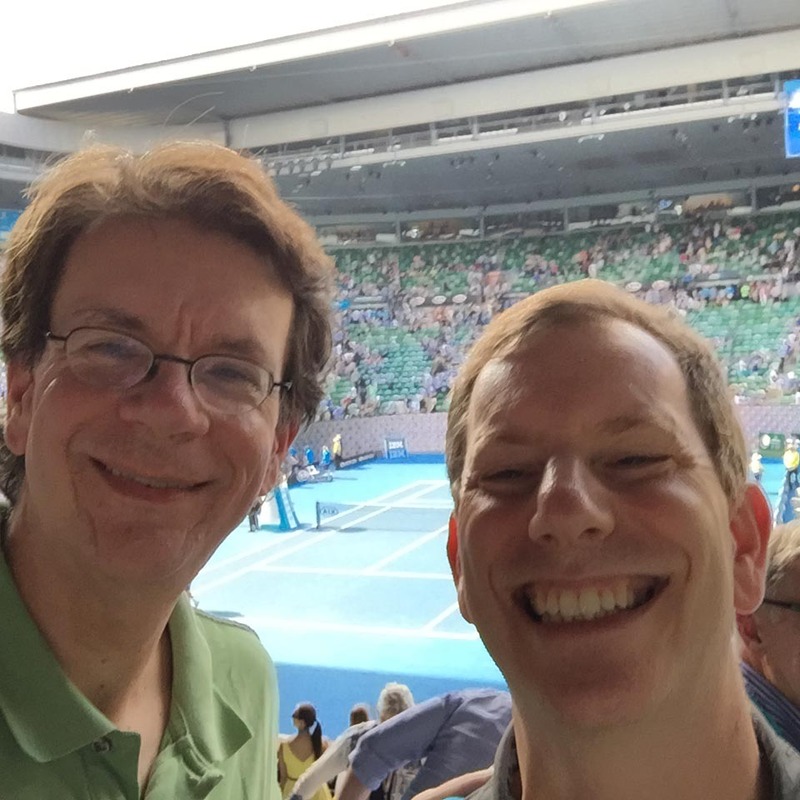 Most recently he went to a tennis tournament - the Australian Open, actually - along with Joe, the official brother-in-law of TigerBlog. Joe has an undergraduate degree and Ph.D. from Syracuse and is a huge Orange fan. As always, TB has an open offer for people who want to write a guest blog every now and then, and BB took him up on that offer for his trip to Australia, just as he did for the Winter Olympics in Vancouver back in 2010. I am TigerBlog’s unathletic brother, and yet I found myself in January in Melbourne, Australia, at the Australian Tennis Open. Actually it was not random or accidental that we were in Australia. It was the 10th-anniversary celebration for my husband and I, and we wanted to celebrate in a big way—like going to the opposite side of the world. 1. Travel to Australia. Yes, it is very, very far away—another hemisphere. It takes a long time from the US. We traveled from Seattle, through Los Angeles, to Sydney, and the LAX-SYD leg was 15 hours. I’ve heard that the longest commercial route is Dallas to Dubai (at close to 17 hours), but 15 was plenty. That’s several meals, several movies, and some sleep if you’re lucky or medicated. We left LAX at 10 pm Sunday and arrived 9 am Tuesday morning after crossing the International Date Line. The good news: After traveling all that way in January, you get to a beautiful, warm, sunny place where they are celebrating summer and where they speak a kind of English (for those who struggle with languages)—but drive on the other side of the road which is potentially dangerous to American pedestrians. We were just leaving tons and tons of Seattle rain. For those of you in Princeton, you would have missed the blizzard. 2. Tennis fans. The word that comes to mind is “demure.” Not as demure and orderly as golf fans, who whisper, but not like football or baseball in larger arenas. Tennis is a more intimate sport. All talking stops when the player throws the ball into the air for the serve. You could really hear a pin drop (metaphorical) or bird sing (actual) in those moments. 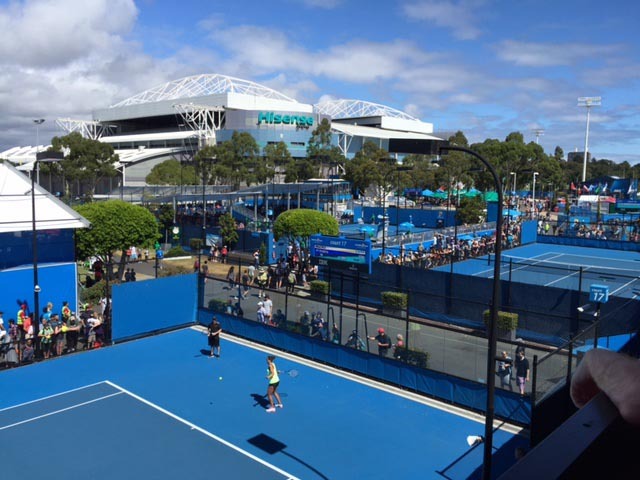 Then the arena is all gasps and cheers as the ball bounces to the outer edges of the singles court or bumps over the net until one player scores. And tennis has the best challenge system of all sports—a quick nod or raised finger by a player, a syncopated clapping rhythm, and then a television screen with the exact position of the ball—all within 15 seconds. Compare that with the challenges in baseball or football that stop the clock, and leave time for several car commercials, while waiting for results. This is the perfect challenge system for fans with attention deficit disorder. 3. Tickets. For those considering going, one can get a grounds pass to wander the grounds (on Saturday, January 23, that would have been with 55,000 of your best mates), or can get tickets for specific matches. We did a combination to get the different experiences. 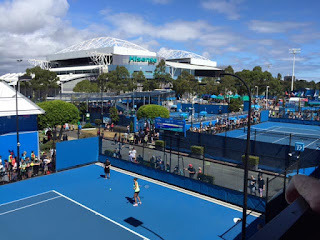 But even with the grounds pass, we were still able to get available seats in Hisense Arena, to see the Tsonga/Nishikori match. (Straight sets for Nishikori.) If you didn’t get there early, there was a two-hour wait on the “queue.” But obviously those grounds passes are way cheaper than tickets for designated matches. 4. Milos Raonic and Serena. No, they did not play against each other. But by going several days, we had the opportunity to follow their progress during the matches. Raonic (ranked 13) beat Wawrinka (ranked 4) in a very close match on Monday, January 25, and then beat Monfils (ranked 23) on Wednesday, January 27. He made it to the semifinals Friday where he played Andy Murray (ranked 2). He was up two sets to one. One could not help but root for the underdog. Was this Raonic’s star ascending? Was the difference in rank between 13 and 2 meaningless? Well, it was not to be that Friday, and Murray won out, only to be defeated by Djokovic (ranked number 1) in straight sets in the finals. But I would look for Raonic in the future to make it into the finals. As for Serena (who needs no last name, ranked number 1), she completely demolished Radwanska (ranked 4) in the semifinal in straight sets without seeming to break a sweat. The excellent match was the other women’s seminfinals—Kerber (ranked 7) versus Konta (ranked 28)—and they came out swinging hard in the first set. Kerber took the first set 7-5, and then it was over (6-2). But, as we now know, Kerber took that intensity into the women’s finals and beat Serena. Regardless of whether one likes or dislikes Serena, it takes a lot of psychic energy to defeat Serena. She has amazing power on the court, and some diva moments as well. But also it is hard not to root for a fellow American on foreign soil. Apparently, according to our cab driver to the airport, she was quite cordial in person when he drove her earlier that week, and she even took a picture with him after the ride. 5. Food. Stadium food is stadium food is stadium food. Loved the “chips” (French fries) and the “drumsticks” (ice cream cones). Stayed away from vegemite, the Australian food paste. But really liked that Australians are even crazier than we are in the birthplace of Starbucks about their espresso, and it was plentiful and delicious. Overall, it was a great experience with very fun Australians in a warm and sunny place in January, and I would highly recommend going to the other side of the world. Just look both ways when you cross the road—you never know which direction the cars are coming from! 4) the commercials were nothing special. The halftime show went poorly for Coldplay, at least if Twitter is to be believed. Did the Super Bowl really need three big-name acts at one time? Can something involved with the game be toned down a little? The Super Bowl was Sunday obviously. Today is the New Hampshire Primary. TigerBlog meant to ask his colleague from Dartmouth Rick Bender what it's been like to be in New Hampshire the last few weeks. TB has been to Dartmouth in enough election years to know it's wall-to-wall politicians there until the primary - and then it's over in a day, and on to the next states. TigerBlog saw Bender at Jadwin Gym Saturday night, when Dartmouth was here for men's basketball. TB saw both games this weekend, against Harvard and Dartmouth, both of which were big Princeton wins. It took 7:33 of the game against Harvard for Princeton to build a double figure lead, and the Crimson would never get within 10 the rest of the way. Princeton then needed just 3:30 to get a double figure lead against Dartmouth and 9:44 to make it a 20-point lead. Princeton would beat Harvard 83-62 and Dartmouth 83-70, meaning Princeton did something this weekend that hadn't been done by a Princeton team since 1974, which is 42 years ago. Back on Feb. 1 and 2 in 1974, Princeton defeated Columbia 90-47 and Cornell 92-56. Prior to this weekend, that's the last time Princeton reached at least 80 points in both games in an Ivy League weekend. The Ivy League season has not yet reached its mid-point, but it's looking very much like a three-team race right now. Yale is currently unbeaten at 6-0, followed by Columbia at 5-1 and Princeton at 4-1. Penn is next at 2-3. Everyone else is either 2-4 or 1-5. So yes, barring a big run by Penn, it's looking like it's three teams. For Princeton, every game is huge, but there are some, well, "huger" ones on the near horizon. The Tigers will be on the road this weekend, at Cornell Friday and Columbia Saturday. Then, the following Friday, it's Yale at home. That's at Columbia and home with Yale in consecutive games, six days apart, after a tough game at a Cornell team that pushes the tempo and then the long bus ride back to New York City. Princeton was very impressive this past weekend. Steven Cook, especially, lit it up, with 21 against Harvard and then 27 more against Dartmouth. Princeton shot better than 50% in both games, and it was 25 for 53 from three-point range for the weekend. TigerBlog hasn't looked that up yet, but he's guessing that 25 threes in one weekend might be a record. There's more. Princeton had 31 assists and 19 turnovers, outrebounded both opponents and had no player go more than 32 minutes in either game. Yale beat Columbia Friday, meaning Yale has beaten both Princeton and Columbia - on its home court. The race doesn't really have a favorite until one of the three loses at home, TB supposes. The first two of six Ivy weekends have gone by. The next two definitely have those, you know, huger games. Will the last two? TigerBlog suspects they will. It makes for an exciting few weeks of Princeton men's basketball. TigerBlog watched the Princeton-Harvard women's basketball game on TV yesterday. Princeton desperately needed a win, and it got one. It wasn't easy. It took five extra minutes. It was a win nonetheless. Princeton defeated Harvard 92-83 in overtime yesterday in Cambridge, completing a weekend sweep that began at Dartmouth Friday night. Princeton has now swept 36 of its last 39 Ivy weekends. The game was even at 72-72 at the end of regulation, which made it a pretty high-scoring five minutes. The game was basically over when Princeton scored the first eight points of the OT, getting them from four different players, starting with a nice Vanessa Smith drive and then including Amanda Berntsen, Michelle Miller and Alex Wheatley. Those four, plus Annie Tarakchian, all finished in double figures. Miller had a huge game, with 28 points while playing all 45 minutes. And Wheatley? Her layup to make it 80-72 gave her 16 for the day and 1,000 for her career. That's a lot of points, 1,000. Only 24 women's basketball players and 30 men's basketball players - of all the players who have ever played at Princeton - have reached 1,000 points. So congrats to Wheatley. And Miller, who got there earlier this year. Princeton had no choice but to win this game. Penn is 5-0 and atop the league standings, and Princeton needs to make sure it doesn't require any help from anyone else in the league to catch the Tigers. This coming weekend will be interesting, as Cornell, who is 5-1, is at Princeton Friday night and Penn Saturday. Since every other team in the league has at least three losses, it's looking like a three-team race for now. That number could change based on this weekend's results. As TigerBlog says, Princeton couldn't have won the Ivy League title yesterday but it could have lost it. Princeton has won five of the last six Ivy League championships in women's basketball. This year's race still has several weeks to go. Other winter sports have already crowned their champs for the 2015-16 year. As a matter of fact, in this current athletic year starting in the fall of 2015, there have been seven women's sports that have already had the championship decided, and guess what? Princeton is 6 for 6. Six women's sports. Six Ivy League titles, either won outright or shared. Princeton won three Ivy League championships this past weekend, including one by a men's team. The women's hockey team defeated Cornell 5-0 Saturday, clinching the outright Ivy League championship. Then, while the women's basketball team was getting its big win yesterday, the women's and men's fencing teams both came away with shares of the Ivy League championship at the Ivy fencing championships at Cornell. For the year, that's seven Ivy titles for Princeton. As for the women, that's six - outright titles in field hockey, cross country, soccer and hockey and shared titles in volleyball and fencing. No school had ever swept all of the championships in one gender in a season before Princeton's women did it in the fall. The highest number of Ivy League championships that Princeton's women have ever won in a calendar year is eight, something Princeton has done twice, in 1981-82 and 2010-11. Princeton needs two more this calendar year to tie that. TigerBlog likes the fencing format, where all of the round-robin matches are played in a single weekend. Both the men and the women had a loss Saturday, and both came back with perfect Sundays to earn their shares. The championships marked the fifth time that Princeton has won both the men's and women's championships in the same year. As for hockey, the ECAC is the actual league, but the Ivy League takes the results of the games played head-to-head among the six league schools who play in the 12-team ECAC and uses those results to create Ivy League standings. It's a fairly creative way to crown the champ. Because the teams are playing off the ECAC schedule, not every team has played the same number of Ivy vs. Ivy games. Princeton played its 10th and final game Saturday against Cornell, who was playing its sixth. The Tigers had a disallowed goal early, but that didn't matter. Princeton shut out the Big Red and tucked in two empty net goals for the 5-0 final and the Ivy title, even though Cornell still has four Ivy vs. Ivy games left. As for the ECAC, Princeton is currently sitting in third with four games to play. Quinnipiac is in first with 29 points, followed by Clarkson with 26 and Princeton with 25. Next is Colgate with 23 and Harvard with 22. The top four teams get home ice for the ECAC playoffs. The second and third finishers avoid Quinnipiac in the semifinals. Princeton is home the next two weekends, against Clarkson and St. Lawrence this weekend and RPI ad Union the following weekend. Goal No. 2 is to be playing at home the weekend after that. Goal No. 1 was the Ivy League title, which Princeton salted away this weekend, making it six for six for the Princeton women this year. TigerBlog can't remember a Super Bowl that he cared less about than the one this Sunday. He's not even excited about the commercials, which have been non-creative in the last few years. You know, trying way too hard to be funny and failing. It's nothing against the Panthers and the Broncos. It's just that he's not as into the NFL as he used to be. He has watched less and less NFL the last few years, with an all-time low this year. This, of course, makes him about 180 degrees removed from the general sports populous, which cannot get enough of the NFL. Ratings have skyrocketed to all-time highs, even as the NFL over-saturates the market with games in as many different windows as it can manage. TigerBlog has watched not one second of Super Bowl preview on TV, and he's listened to none of it on the radio. It just doesn't interest him. He'd like to see Denver win. Maybe. On the one hand, it would be good to see Peyton Manning win in what hopefully is his final game. On the other hand, it's also good that Eli Manning has won two Super Bowls and Peyton has only won one. TigerBlog thinks Carolina has the better team, but Denver's defense is really good. So maybe it won't be high scoring. Going back to the summer, TigerBlog's preseason Super Bowl prediction was Baltimore and Philadelphia. They went a combined 12-20, so that wasn't a good pick. For the game Sunday, how about Denver 21, Carolina 17, with Manning the MVP even though he doesn't do much? So that's Sunday night. Maybe TigerBlog will watch. Maybe he won't. Between now and then, it's a big weekend in Princeton athletics. From this morning through kickoff Sunday night, there are 34 Princeton Athletic events, with, if TB counted right, 16 different teams. There will also be Ivy League titles award, as the men's and women's fencing round robins will be held at Cornell tomorrow and Sunday. The women's hockey team plays its final Ivy League game of the year tomorrow at Cornell, and a win would clinch at least a share of the league title for the Tigers. Princeton lost 2-1 to the Big Red back in November at Baker Rink, but the Tigers are 17-5-1 overall and 7-2-0 in the Ivy League. As for the ECAC, Princeton is tied for third with Colgate at 10-5-1, for 21 points, one behind Clarkson for second (Quinnipiac is first with 27). Harvard is in fifth with 19. The top four teams in the league earn home ice in the ECAC playoffs. The men's team is home against Colgate tonight and Cornell tomorrow. Princeton has five wins on the season, which means this year will be an improvement over last, and the Tigers are tied with the Raiders for 10th place. Home ice for the ECAC playoffs goes to the top eight, leaving Princeton five points behind. But that's not what's important for this year. No, Year 2 under Ron Fogarty has been about improvement and progress, and Princeton is clearly moving in the right direction. As for basketball, the women are on the road this weekend, with a game tonight at Dartmouth and then Sunday afternoon at Harvard. Princeton is 2-1 in the league, a game back of Penn, who plays at Harvard tonight and Dartmouth tomorrow night. The Harvard game can be seen on American Sports Network. HERE'S the list of outlets showing the game. As for the men, they're home tonight against Harvard and tomorrow against Dartmouth. The game tonight is on ESPNU at 7, while tomorrow's game is at 6. Harvard might be 1-3, but sell the Crimson short at your own risk. There is a long way to go in the Ivy race, and the game tonight is one of the defining games in the league as the race shapes up. Who else is home this weekend? The whole schedule is HERE. Apologies to anyone TB is overlooking, but there is home men's and women's swimming and diving, men's tennis and men's and women's squash. Admission to those events is free. Oh, and there's also a home men's lacrosse scrimmage at 1 tomorrow against Monmouth. Men's lacrosse scrimmage? Hey, there are nine actual regular season games this weekend already. So who needs the Super Bowl with all that going on. Remember, TigerBlog has it Denver 21, Carolina 17. It'll be more like Carolina 28, Denver 14. Yeah, let's go with that one. One of TigerBlog's favorite parts of paying the bills each month - you know, other than the sheer joy of spending all that money - is to see how many minutes on the phone and text messages TigerBlog Jr. and Miss TigerBlog have combined for in the preview few weeks. This past month? It was more than 3,000 text messages and a total combined of 15 minutes on the phone. TigerBlog Jr. with five minutes. MTB with 10. That's not a lot of time on the phone. For TBJ, TigerBlog will assume all five of those minutes were spent ordering pizza or something. The thing about the text messages is that TigerBlog also thinks they spend as much or more of their time communicating via Snapchat, something that isn't tracked on the cell phone bill. Well, for one thing, it's that the generation of people who are, say, 25 or younger don't need to communicate with people directly and as such never really learn to do so. They can carry on whole relationships with people with whom they rarely if ever actually speak and get used to conversing in abbreviations, or incomplete sentences, or poor grammar. And that's not even counting the whole 140-character thing. Or the way a group of, say, four 15-year-old girls can be in the same car at the same time, all of them on their phones, none of them speaking, all of them laughing at the same time. TigerBlog is fascinated by this, and he's experienced this more than once as he's driven MTB and her friends around. They're clearly connected to each other on their phones. None of them are speaking. And they're all laughing at the same exact time, which means at the same exact thing. It's weird. And normal. At the same time. On the other hand, TB thinks that kids become more sociable, rather than less, because they maintain relationships with so many more people and on a much more regular basis. He sort of wonders how he would have done with it had all of this been the case when he was 15 or 18. Is all of this good or bad for the future of the world? Both, TB supposes. There are lessons in here for college athletic marketing, too. You know, in the best ways to reach students to let them know about games and promotions and such. Of course, another way to let them know is to simply send a bunch of the athletes out onto the campus with a microphone, a videographer, a mascot and some t-shirts. That's what Princeton athletic marketers Carolyn Cooper and Caroline Kelly and videographer Cody Chrusciel did Tuesday afternoon. They sent men's basketball players Spencer Weisz, Mike Washington, Amir Bell and Devin Cannady - and the Tiger - in and around the Frist Campus Center to let their peers know that Princeton is playing Harvard tomorrow night. The game is at 7. There will be free pizza for students. One student will get a chance to win $1,000. And the game is on ESPNU. That was the message that the four players were getting out. And they did it fairly humorously. They were all very comfortable behind the mic and talking to the students who were walking in and out of the building. They were pretty funny, actually. Weisz, for instance, introduced himself to most of the students he spoke with as "Spencer Weisz of the Daily Princetonian," and not one of them questioned this. Maybe it's because he was wearing a purple sweater as opposed to the Princeton Basketball gear the other three were wearing. Either way, maybe the funniest moment wasn't caught on camera. That was when Washington said to Weisz "you were the Ivy League Rookie of the Year two years ago. You'd think somebody would recognize you." Anyway, they had fun with it for a half-hour. You can see the video on goprincetontigers.com. And who knows, maybe they've helped drum up some students to come to the game who otherwise might not have. The game against Harvard is followed by one Saturday against Dartmouth. Princeton still has all seven home Ivy games left. It comes into this weekend at 2-1 in the Ivy League after its loss at Yale last weekend. Yale and Columbia are both 4-0 in the league, and they play tomorrow in New Haven. Since that game is at 5, the Bulldogs will have played four home Ivy games before Princeton plays one. Only Princeton has one league loss. Cornell has two; every other team has at least three. A Princeton sweep this weekend and even one Cornell loss and the race might start to look like it's between three teams - Princeton, Yale and Columbia. On the other hand, Harvard - now 1-3 - can get right back into the thick of it with a sweep of its own. Either way, this is the weekend where the league race will really start to come into focus. Only five times in the last 25 years has a team with at least three league losses won at least a share of the men's basketball championship. So that's what's riding on the game tomorrow. Maybe there will be a few students there who have a new orange t-shirt who will be wondering why the kid from the Daily Princetonian is starting for the men's basketball team. Hey, that was all fun and games. Tomorrow night it's just the game, and it's a serious one at that. Sam Cila has a way of getting your attention. Maybe it's the direct, pull-no-punches, nothing-sugar-coated way he speaks. Maybe it's the deep, powerful voice, the one that intimidates and challenges at the same time. Maybe it's the way he doesn't want to hear what you might think he wants to hear and instead turns that back around on you, challenging you to actually dig deep and find the right answer. Maybe it's the tattoos that he has on both arms, sticking out from under his shirt, the one that says "The Program," with the circular logo with a warrior inside. Or maybe it's just the tattoos on his left arm. 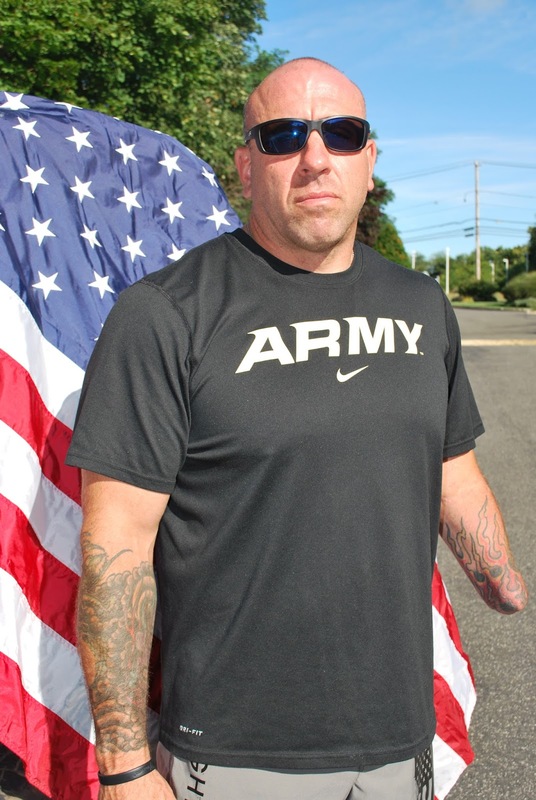 They're the ones that end at the stump, where his hand used to be, before he was injured in Iraq more than a decade ago, before he had 40 surgeries on his injuries, before he had to have the hand amputated. Or maybe it's what he says. He talks about his injuries openly, and yet there's not one piece of him that wants sympathy. In fact, that would probably just anger him. He talks about the three most difficult things he's had to do in his life: 1) tell his wife and children that he was going to war, 2) have a friend and teammate die in his arms in war, and 3) tell the doctor that finally it was time to amputate his hand. This is one tough man, and there is not one ounce of BS anywhere in his body. So yes, when he talks, he gets your attention. Early yesterday morning - before the sun came up, at 4:40 a.m. - Sam Cila was on the pool deck of Dillon Gym. The people he was talking to at this moment were the members of the Princeton men's lacrosse team. TigerBlog was able to observe - and learn. The program - officially called "The Program" - is designed to build teamwork and leadership and accountability. It's a challenging program, and it was from the first moment Monday when Cila lined the Tigers up on the end line on Sherrerd Field. Oh, and a little more about Sam Cila. He was a high school wrestler. He has a wife and two children. He had a career with the Department of Corrections before 9/11, when he decided that he would enlist. If it's good enough for someone else to fight, he said, then it was good enough for him. He went to Iraq in the late summer of 2004. Nearly a year later, on of all days July 4, 2005, Cila was almost directly on top of an IED when it was detonated, ripping into his left side. Today his biggest regret appears to be that he could not continue his military career and finish the fight he signed up to fight. He owns a CrossFit gym and has put his other time to good use, what with his experience climbing some of the highest mountains in the world and doing triathlons on the international level. And he does "The Program." Princeton's first day of practice was Monday, but instead of lacrosse sticks and helmets, the Tigers got a lot of running Monday evening and a lot of swimming Tuesday morning. Cila set the tone early Monday and it stayed that way until the very end. TigerBlog watched it, and he saw the evolution, as the team figured out that Cila's version of a straight line and most people's version of a straight line weren't exactly the same thing. By the end of "The Program," they understood. They also understood what it meant to be a team, what their responsibility was as a teammate, how they needed to be strong and confident in their individual selves at the same time. It was pretty fascinating to watch. The two days ended with a drill that saw the players wear their gray Princeton lacrosse sweatshirts, swim out into the pool, take the sweatshirts off, hold them up in the air, trade them with a teammate and then put the other one on. All while treading water. At the end, Cila gives an award to the one member of the team who has done the best. It's a cherished award, one that is well-earned in every way. And what is it? It's a gray t-shirt. It has the logo, but it's not a circle. It's a shield, Cila says, the Spartant shield. Spartan soldiers were sent into battle with a shield and a spear. To lose the spear was acceptable. To lose the shield was not, since it exposed not only you but also your fellow soldiers. The winner was Jack O'Brien, a junior face-off man. TigerBlog might not have wanted to get up at 4 am yesterday, but he's glad he did. He's glad he got to see "The Program," and to meet the man who was running it. It'll be awhile before TB forgets Sam Cila. He's pretty sure the Princeton men's lacrosse players feel the same way. Sam Cila is heroic, even if he doesn't think he did anything special - and TB believes that his modesty is genuine. And here he was, someone who had given so much of himself in a war that he didn't have to go fight but chose to, talking to a group of young athletes who hopefully will never have to experience what he did.